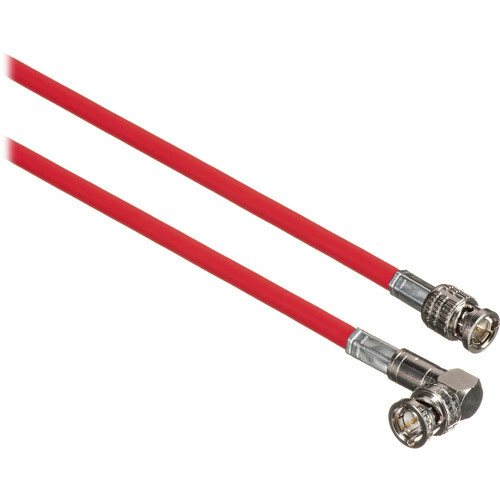 The red Canare L-5CFW RG6 BNC Male to Right Angle BNC Male HD-SDI Video Cable is a 75' cable that is hand-assembled with Canare extra flexible L-5CFW HD-SDI RG6 coaxial cable, and Canare true 75-ohm HD BNC connectors. This cable is 100% sweep tested to conform to the SMPTE 292M standards, supporting up to 1.5 Gbps transfer rates. Box Dimensions (LxWxH) 9.9 x 9.0 x 2.2"